I found the trail that connects the old road along the river to the NFA land and town open space! Of course, I didn't see it on the way in, rather the way out. If you zoom in at Waypoint 31, you will see where I added in line that goes to WP 22 which is at the edge of the open field (white on the topo). Not sure where this trail goes but on the map there is house in that direction the field is no longer NFA land. WP 31 is the intersection that is a connector trail to the main trail. It was covered with Barberry and that is why I missed it on the way in but on the way out, I marked WP 29 where the trail branches and thus connects with the trail out. 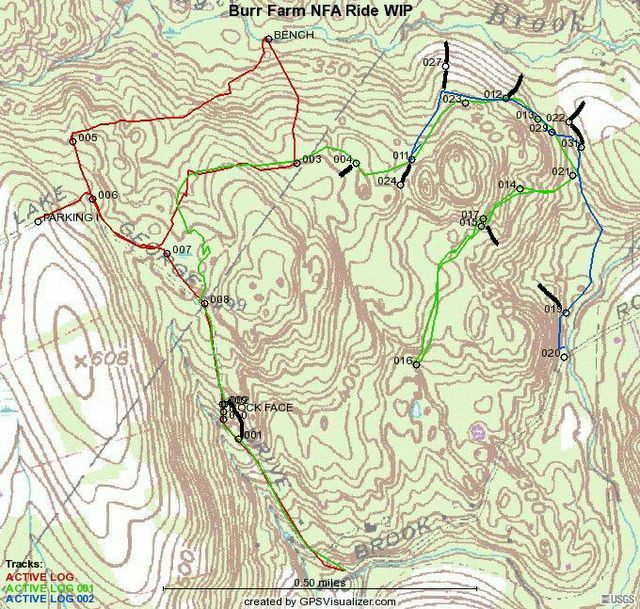 At WP 12, there is a trail heading off into the woods that may or may not hook up at WP 27. Next time I ride this area I will go that way and see what's up. I did try to find a connection at from WP 11 that meets up with trail between WP 15 & 16 but got as far as WP 24. There is an animal path but not something that I would want to ride on a regular basis. I think next time I need to go up to WP 4 and see where that goes. 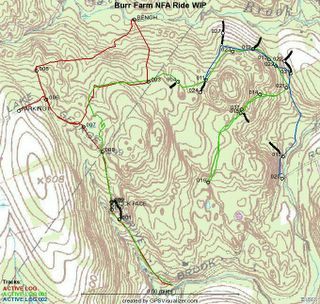 Overall, the Burr Farm is noobie ride, with the exception of the roller in the middle of the ROW (Lake George Rd), these are green trails. However, as far as quick workout goes, they are perfect.